Redplug is very pleased to announce hardware upgrades that deliver content faster than ever before, bringing a more responsive experience to website users. We've just launched our new primary web server with 2.5x the storage capacity on solid state drives, 4x the RAM, and 4x the cores of the old server. Benchmarks show that the new server is 2.44x faster! The new server includes the newest versions of tried and true software including Enterprise Linux, the popular Apache web server, the rock-solid Maria database, and the powerful PHP web scripting language. Redplug relies on this software to build and deliver dynamic web pages that respond intelligently to the needs of your users. 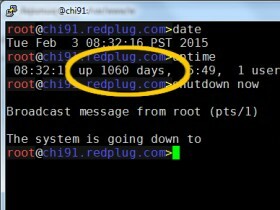 After 1,060 days of uninterrupted service, the old server was finally shut down today. This upgrade was pushed to all Redplug website customers at no additional charge. Regular hardware and software upgrades are included in all of Redplug's monthly hosting/management packages.